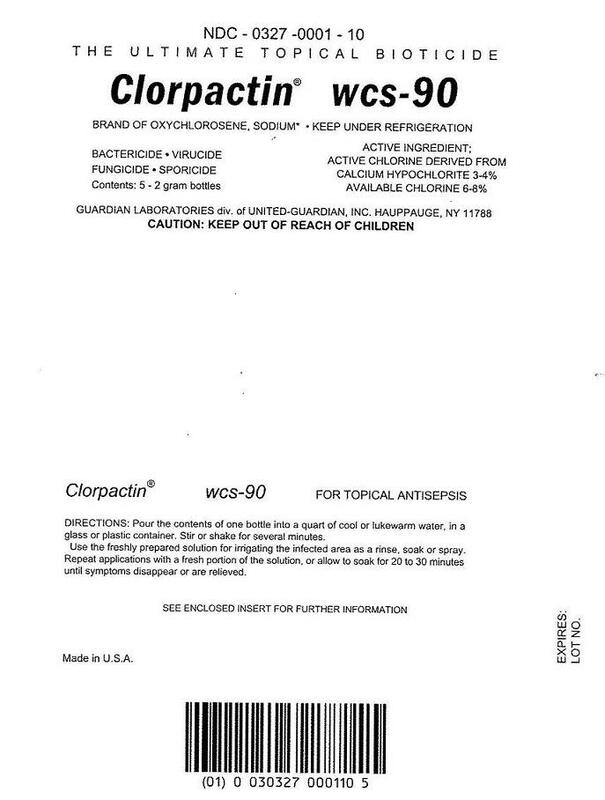 Add the Clorpactin WCS-90 powder to sterile or deionized water at room temperature (20-25° C.). The powder dissolves slowly in water. As a result even after 2-3 minutes of stirring or mixing some residue of incompletely dissolved product will remain. This residue consists of inactive ingredients and therefore there is no necessity to continue to stir or mix for a longer period of time. This residue can be removed by either filtering the solution through a coarse laboratory filter or allowing the solution to settle for about 5 minutes and then decanting the clear solution for use. 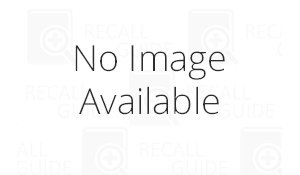 Clorpactin WCS-90 solutions should preferably be used as soon as possible after preparation. If the solution must be stored, it can be kept refrigerated (4-8° C.) for up to 14 days in a capped or sealed plastic or glass container using a non-metallic cap. It can be stored at room temperature (20-25° C.) for up to 7 days after preparation. As with any chlorinated product, Clorpactin WCS-90 solution should be prepared in a ventilated area and inhalation of the vapors should be minimized. The solution can cause bleaching of fabrics or other materials if splashing or spilling occurs. Renacidin Irrigation (sterile, non-pyrogenic) in water for local irrigation within the urinary tract. The action of Renacidin Irrigation in the prevention and dissolution of calculi results from an ion exchange mechanism or solvent action. (See Clinical Pharmacology) Parenteral drug products should be inspected visually for particulate matter and discoloration prior to administration whenever solution and container permit. Renal Calculi: See Precautions. It is essential that patients be free from urinary tract infections prior to initiating chemolytic therapy. Urine specimens should be collected for culture and appropriate antibiotic therapy should be initiated for any bacteria identified. A nephrostomy tube is placed at surgery or percutaneously to permit lavage of the calculi. A single catheter may be sufficient if the calculus is not obstructing the ureter or ureteropelvic junction. In patients with an obstructed ureter, a retrograde catheter can be placed through the ureter to the renal pelvis via a cystoscope. This second catheter is used to irrigate the calculus while the percutaneous nephrostomy tube is used for drainage. Plain radiographs and nephrostomograms are performed to assure proper placement of the catheter(s). Pressure measurements are made under fluoroscopy to assure that 2-3 mL/min can be infused without causing pain, pyelovenous or pyelotubular backflow or manometric evidence of elevated pressure within the collecting system. For postoperative patients irrigation should not be started before the fourth or fifth postoperative day. Irrigation of the renal pelvis is begun with sterile saline only after a sterile urine has been demonstrated. The saline is infused at a rate of 60 mL/hr initially and the rate is increased until pain or an elevated pressure (25 cm H20) appears, or until a maximum flow-rate of 120 mL/hr is achieved. The site of insertion should be inspected for leakage. If leakage occurs, the irrigation is discontinued temporarily to allow for complete healing around the nephrostomy tube. If no leakage or flank pain occur, irrigation is then started with Renacidin Irrigation with a flow rate equal to the maximum rate achieved with the saline solution. A clamp should be placed on the inflow tube and patients (see Precautions) and nursing personnel should be instructed to stop the irrigating solution whenever pain develops. Nursing personnel who are responsible for performing the irrigation must be instructed concerning the location of the nephrostomy tube(s) and the direction of flow of the irrigating solution to insure against misconnection of the inflowing and egress tubes. Nephrostomograms should be performed periodically to assure proper placement of the catheter tip and to assess efficacy. If stones fail. to change size after several days of adequate irrigation the procedure should be discontinued. Upon demonstration of complete dissolution of the calculus the inflow tube is clamped and left in place for a few days to ensure that no obstruction exists, after which time the nephrostomy tube is removed. Bladder Calculi: Chemolysis of bladder calculi is used as an alternative to cystoscopic or surgical removal of the stones in patients who refuse surgery or cystoscopic removal or in whom these procedures constitute an unwarranted risk. Following appropriate studies to evaluate possible vesicoureteral reflux, thirty mL of Renacidin Irrigation is instilled through a urinary catheter into the bladder and the catheter is clamped for 30-60 minutes. The clamp is then released and the bladder is drained. This is repeated 4-6 times a day. A continuous drip through a 3-way Foley catheter is an alternative means of dissolving bladder stones. In the presence of bladder spasm and associated high pressure reflux, all precautions required for irrigation of the renal pelvis must be observed. Indwelling Urinary Tract Catheter Encrustation: Periodic instillation of Renacidin Irrigation is indicated to minimize or prevent encrustation of indwelling catheters which frequently results in plugging of the catheter and discomfort to the patient. This is accomplished by instilling 30 mL of the solution through the catheter and then clamping the catheter for 10 minutes, after which the clamp is removed to allow drainage of the bladder. This process is repeated 3 times a day.